Virtua Fighter 2 © 1997 Sega Enterprises, Limited. 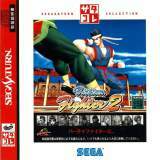 Reprint of "Virtua Fighter 2 [Model GS-9079]". Released on April 25, 1997 in Japan.